You want to sponsor "Hope & Give"? Thank you! 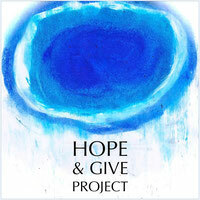 - hopeandgives Webseite! You want to sponsor "Hope & Give"? Thank you! We are happy to work on this project for the next 365 days, making sure that all your hopes will become 730 original paintings, just as individual as you are. Our first project gave us a pretty good insight into the work-load, the challenges, and the costs we will face. We are aware of the pitfalls of international mail, we know the tariffs, how to send a carefully padded parcel to the smallest village somewhere on this planet by postal service. It takes an enormous amount of art materials to create 730 new original paintings. All of it has to be shipped from Germany, England and beyond to our small Greek island. And we know quite exactly the materials needed. This adds up to $ 115 per painting. From July to September through a crowdfunding at Indiegogo 111 generous people donated 11,065 US dollars. This finances the fist 96 paintings. Each additional 115 US$ will fund another picture. For a full year, we will do everything we can to fulfill our promise: to give a painting of their hopes to 365 people and a second painting to give away to someone they want to share their hope with. What’s in it for you? First, of course, the joy of giving. Second, you are involved in spreading hope through art. But it would be somewhat unfair if that was it and you were only rewarded in thought. That is why you will receive a unique painting for each contribution you make. 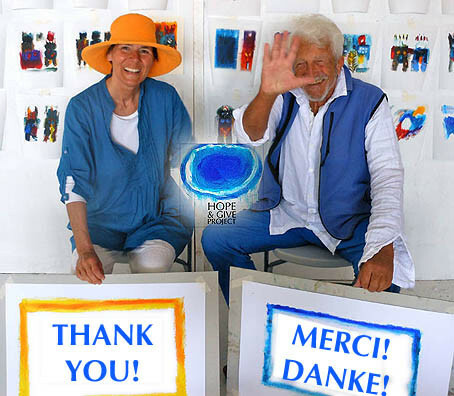 In return for a small contribution, you will receive a postcard-size painting; for a huge contribution, you can expect to receive a painting would require a dining hall in a small palace to display it. , at the Hall of 'THE HOPE & GIVE TEAM' and at the end within our worldwide exhibition, online and at 730 worldwide locations as well as in the big final publication. We created a specific site on Peters art website for that. There you can choose your perk and complete the payment. See here. We transform live, together. Thank you so much.